Need a affordable taxi arnhem straight away? Would you like a ride to the airport or railway station to start off your business trip or vacation? Does your group of people need a taxi bus? Taxi Arnhem Danny Deluxe takes you anywhere you like; safe, fast and carefree. And, of course, we gladly drive you home. Rest assured that we offer reliable rides at competitive prices. Taxi Danny Deluxe does not apply call-out charges to and from Arnhem. Taxi Arnhem Danny Deluxe drives you to the airport, party or any other destination, at affordable rates. Call +31 6 427 326 77! 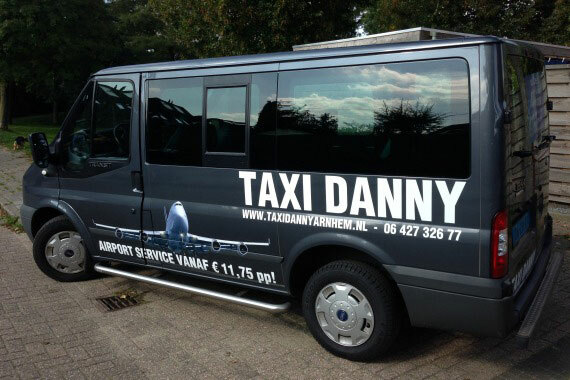 Would you like Taxi Danny Deluxe to drive you directly from Arnhem to Schiphol or any other airport? We take the shortest routes to your destination, at your most convenient time. We also welcome larger groups. We are the cheapest airport service in Arnhem because we offer discounts of 65% off the regular rate and we pre-determine realistic fixed prices with you. Would you like to book a taxi for today? Preferably contact us by telephone. For bookings on short notice, we fail to guarantee timely processing of your booking via our contact form. Make sure you receive our confirmation. Otherwise, we are unable to guarantee your taxi will arrive at you timely. Please consider that for last minute bookings, higher fees apply. Taxi Arnhem – Schiphol starting from € 15,60 p.p. Taxi Arnhem – Düsseldorf starting from € 17,50 p.p. Taxi Arnhem – Eindhoven Airport starting from € 15,60 p.p. Taxi Arnhem – Rotterdam Airport starting from € 17,- p.p. Taxi Arnhem – Vliegveld Weeze starting from € 11,75p.p. Taxi Arnhem – Frankfurt Airport starting from € 53,-p.p. Taxi Arnhem – Köln Bonn Airport starting from € 27,50p.p. Taxi Arnhem – Brussel Airport starting from € 35,-p.p. For over 14 years, Taxi Arnhem Danny has driven you safe, comfortable and affordable from A to B. Having a party with your friends in Arnhem without a designated driver, is that possible? Taxi Danny Deluxe offers a wide range of options for groups over four people. For instance, to attend a wedding, event or conference. Our taxi buses are equipped to transport eight persons. Is your group larger than that? We have other taxi buses available. Other examples where taxi buses are beneficial are transport to and from Gelredome stadium or the nightlife of downtown Arnhem. Besides these, we take pleasure in driving groups to airports and other destinations. If you would like to travel with a group, we advise you to make your reservation timely. What will the taxi trip cost you? Rate for time 15 x € 0,36 = 5,40. Are we stuck in traffic? If we end up in congestion this will be to the disadvantage of the customer, unfortunately. If traffic is fast, you will reach your destination more quickly and save money! You may ask our drivers to wait for you. Special waiting fees apply. Of course, no kilometer rate is added. The waiting fee is to be paid in advance, and your driver will wait up to an hour for your return. We often apply fixed trip prices. This means you will not be faced with any surprises as far as expenses are concerned. Our operator determines the price with you. For our airport service, we apply 65% discount. For trips to the city center of Arnhem, we apply standard 20% discount, except on holidays and during events.